An automatic litter box eliminates one of cat owner's least favorite past times. 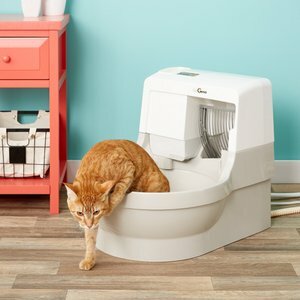 The undoubted king of the automatic litter box world is the CatGenie Self-Flushing, but let's look at some other options too. Cleaning litter boxes is a laborious chore that faces all kitten and indoor cat owners. Never fear, the future is here! Okay, maybe not that futuristic. Self cleaning litter boxes have been around for a few years now, but the industry is constantly improving and the products are becoming better and better with every release. We’re here to round up the best automatic litter boxes, starting with our favorite; the CatGenie Self-Flushing Cat Box. Since you’ve arrived here, you probably already have an interest in purchasing and are just looking for a few options to weigh up. Let’s help you with that before we get on to rambling about why we think they’re so great. 6 Will My Cat Use An Automatic Litter Box? 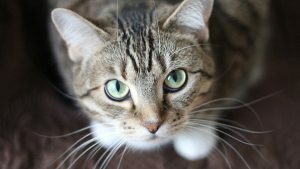 The table above contains a list of our top picks for the best self cleaning litter boxes. Each pick is a perfectly viable option to take on the task of cleaning up litter so you don’t have to. Our ratings are based on effectiveness, ease of use and value for money. To help you make the all important decision on which self cleaning litter box is the one for you, we’ve reviewed them in a little more depth. Below is a list of the best self cleaning litter boxes for cats, reviewed with value for money in mind. A really interesting design this one. It’s built in the image of a traditional (human) toilet, and even flushes like one. It’s also interesting in that it’s the only litter box we’ve ever seen that uses a permanent re-usable litter in the form of granules. Yep, you heard that right, permanent. It recycles the litter and churns out any waste via a pipe that needs to be connected to a waste line or toilet (it really doesn’t take that long to set up). While our immediate reaction was probably similar to yours, “oh my god, we finally never have to buy cat litter again”, that’s not quite true. Each clean usually loses a little bit of litter via waste, while it isn’t much, it does add up. Every 6-8 weeks or so you’ll need to purchase a new cartridge, which will give you up to another 240 washes. They aren’t expensive, so it still works out slightly cheaper than buying regular cat litter every few weeks. These cartridges come in both a scented and unscented version, it’s down to personal preference but we found unscented to be best. The mechanical motion of flushing can cause the “fresh” scent to be stirred up and as a result it’s quite potent. 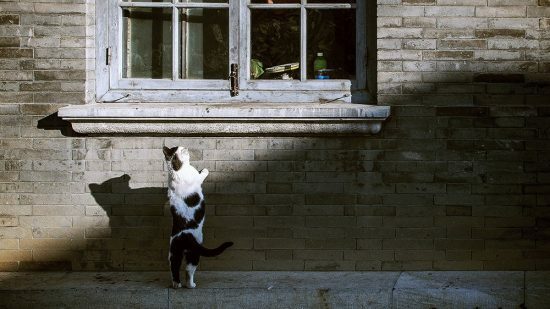 You’ll waste less litter and get the best results if your cat tends to pass firm stools. Since this isn’t something you can control apart from by diet, don’t worry about it too much, it’s still very good at separating stool from litter. It’s dimensions are 24.5 x 19.2 x 21 inches, so it’s slightly smaller than the some of the bigger automatic litter boxes our there, but is still suitable for large cats and multi-cat households. We found it best when used with the GenieDome, an attachment that covers the litter bowl up to offer cats some privacy. It also looks a lot better around the home when the bowl is covered up. We’ve seen reports of some issues with clogging, though it seems these are mostly caused by cat hair that has fallen into the bowl and built up over a long period of time. It’s hard to see that as a fault with the machine itself, since regular brushing should be a part of every cat owner’s routine. 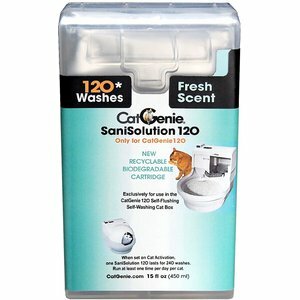 You’ll quite literally never have to deal with your cat’s waste hands-on when using the CatGenie 120. It separates and disposes of waste automatically and you never have to worry about cleaning up. Best, feeling, ever. If it’s complete automation you’re after, then this is the best self cleaning litter box for you. We absolutely love the PetSafe ScoopFree Ultra. For us, it’s the perfect blend of efficiency and affordability. At the time of writing it’s roughly a third of the price of our highest rated option, but performs as well as you could hope for a cheaper self cleaning litter box. It features an adjustable delay settings, so you can decide precisely how long after your cat has visited the rake should run to clean up. We found it best to set this for sooner rather than later, so odors don’t get a chance to take hold in your home. A removable privacy hood that contains odors and makes the whole think look a bit nicer, and a health counter. The health counter tracks how many times the box has been used. It’s surprisingly handy because it’s often difficult to tell whether or not your cat has been making proper use of an automatic litter box without you being there to witness it. Waste is filtered into a disposable tray that sits beneath the device, and the crystal based litter works to dehydrate the waste so it’s less likely to release odors once it’s been collected. It can self clean without any inference for weeks at a time, which is quite incredible given it only measures 28.5 x 20.5 x 11.5 inches. Crystal litter is much more granular than regular litter, so it may be worth purchasing some separately and giving your cat time to adjust to crystal litter in a familiar setting before moving them onto this. The refill trays are available in a few options, there are scented and unscented varieties and a dye free option. They claim to use around 5-10x less litter than conventional litter boxes, but the official refill trays can set you back quite a bit. It’s estimated that a single refill tray can last as long as 30 days in the best conditions (a single cat home) though, which isn’t too bad at all. We will make one recommendation here though, you’d best invest in a Forever Tray. You’ll still need to replace the litter itself every 30 days or so, but you’ll save a tonne of dollar in the long run not requiring a new tray each and every time you need to freshen it up. It’s very quiet, just a low hum from the machine. It did freak our cat out at first but it after an hour or so they were pretty comfortable with it. We’ve noticed that the crystal litter is really effective at not tracking all around the house after it’s been stood in, which is a really nice bonus. All in all it’s a fantastic option for those without the budget to accommodate one of the other more expensive options above. It hold it’s own against the best self cleaning litter trays available, but lacks a lot of the extra features you get with those. If it’s still a little on the pricey side for you, our next recommendation may be more up your street. The PetSafe ScoopFree is the baby brother of the superior PetSafe ScoopFree Ultra we just spoke about. It’s earned a place on our list as the best budget automatic cat litter tray option. You lose the privacy hood (which can be purchased separately), the ability to adjust the rake delay, and the health counter. Features that aren’t really a necessity, but do really polish off the product as a whole. The rake delay isn’t really something we missed, the health counter is a nice feature though, and it’s worth the extra few bucks. We noticed that we really missed the privacy hood, as it seems to do a good job of containing odors for a little longer. It also makes the whole device look a bit neater and prettier. If you were to purchase this automatic litter cleaning unit and the hood separately, you’d be paying not far off the price of the Ultra model. If you think you’ll ever need to purchase the hood, we’d recommend you just buy the Ultra version. That way you’re getting the best model available and the extra features in the first place. Other than that, it does the same job as the Ultra model, so much of the merit remains. It’s a solid all round automatic cleaner, that’s as cheap as they come. The same logic applies to the re-usable litter trays as with the Ultra model. They’re quite expensive. You’re far better off purchasing the “Forever Tray” and saving yourself a fortune in the long run by just having to replace the litter, which is available much at a much lower price. It’s not the best self cleaning cat litter tray out there, but it’s the cheapest and it works. So it’s definitely earned it’s place on our list, even if we do recommend opting for the Ultra if your budget allows it. As with most things, it comes down your personal need. For us, they really are worth the investment. They save you a lot of time, make sure the litter tray stays clean and smells fresh, and you never have to face that familiar smell of a used litter box again. These boxes also do a great job of reducing litter dust. The fact that you’re even here reading this article suggests you’ve had enough of performing the task manually, as have most cat owners. We honestly believe that if more owners were aware of the efficiency and affordability of the newest self cleaning litter boxes, they’d be willing to give them a try. It’s just that us humans are often stuck in our ways. There’s obviously a decision to be made on how much you want to spend. We’d say it’s worth investing in one of the best automatic litter boxes, the self-cleaning ability is likely to be far superior and run much more reliably. After all, the point of the purchase is to take the work out of your hands. 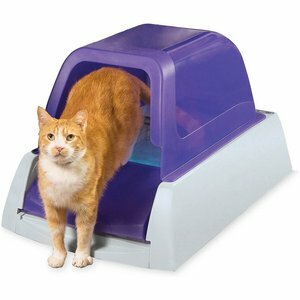 A cheap automatic litter box is likely to get clogged up or be a pain to maintain, which is far from ideal. At the low end of the scale, you’re going to be looking at a minimum of a hundred dollars or so for a top of the range self cleaning litter box. The higher end of the scale is often 3x more than that, but do come with more functionality, and are generally easier to maintain. Many are weary that their cat may not use automatic litter boxes, making the purchase a waste of money. This moves us on to our next point. 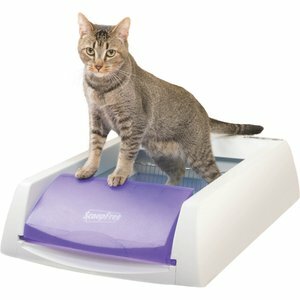 Will My Cat Use An Automatic Litter Box? In almost all cases, the answer is yes. Cats are notoriously fussy, everyone knows that. It may take some time for them to become accustomed to a machine litter box, but with perseverance even the most stubborn little kitties will use them. Keep in mind that the best self cleaning litter trays have been specifically designed to make them appealing for cats. You’ll notice that all of the models we reviewed above either come with, or have available, a privacy hood to enclose the space. If you’ve opted for a model without a privacy hood, try purchasing one as an attachment if you continue to have issues. Cats love tight enclosed spaces as they make them feel safe. It can take a little longer for cats to get comfortable around a machine, especially once they’ve seen it in action making a noise. Most of the boxes on our list are intentionally as quiet as possible for this precise reason. They do still let out a dull humming noise though, and the movement alone is enough to spook some timid cats. In some cases, the self cleaning litter box will come with it’s own variety of litter. This can make the transition from regular litter box to an automatic one that little bit harder. If your litter box does use a special kind of litter, you’ll be able to purchase refill packs. It might be a good idea to purchase a refill pack to use with your existing litter tray first. This will help your kitty feel comfortable using the new type of litter in a familiar environment. Not all of the litter used in self cleaning litter trays will be suitable for use in a standard litter box . Have a read up on whether they are or aren’t before you try the above. 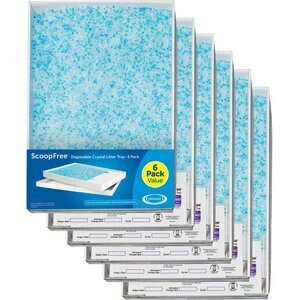 In the case of the PetSafe ScoopFree self cleaning litter box, a crystal based litter is used. Most owners and cats will not be familiar with crystal litter, so it can be quite a big change having to move onto this from a more common litter, keep that in mind! Obviously the standout benefit is apparent from it’s name. It’s automatic. 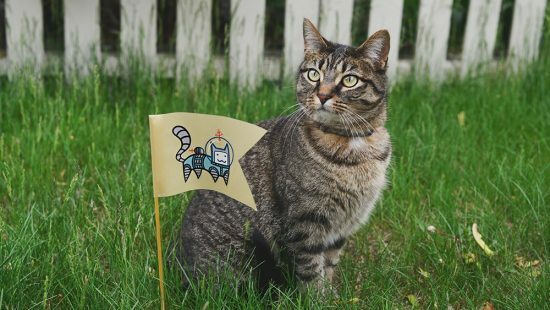 You won’t have to come in close contact with cat poop ever again. Hallelujah. Other than that though, they also offer a whole host of other benefits that might not be so obvious unless you’ve seen them in action. Luckily for you, we have seen them in action, and these are what we found to be the main benefits of a good self cleaning litter box. Odor management in cat litter is a huge concern for us, we love having guests round and the last thing we want is a stinky litter box. With a self-cleaning litter box, this is much less of an issue. We were initially skeptical, since most of the automatic boxes use a different kind of litter that isn’t renowned for it’s odor prevention qualities. Nothing to worry about though, with most of the best self cleaning litter boxes offering an adjustable rake delay, you can set them to run as close as 3 minutes after your cat has finished their business. Smells won’t travel far in 180 seconds, especially if your automatic litter tray has a privacy hood. 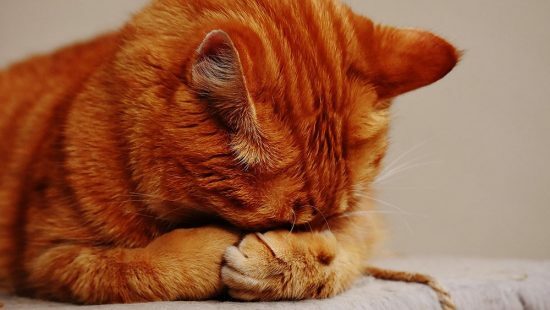 Cleaning so quickly after the litter box has been used means that smells don’t get a chance to spread through the house and the litter box itself is fresh and clean ready for the next usage. Super, super convenient is the best way to describe self cleaning boxes. The best models are totally self sufficient, with boxes like the CatGenie being capable of disposing of the waste itself meaning it can be left to it’s duty for several weeks at a time. You’ll never go back to a regular litter box after trying one of these. Built with hygiene in mind, these top of the range automatic litter boxes will serve to eliminate waste and stop bacteria growing in your litter box. The models that don’t self dispose contain a sealed off compartment in which waste is stored and dehydrated. When the time comes to change trays, you just swap the old out and place a fresh one in. No need to come in contact with any waste at all.